Spain, Portugal and Morocco - three magical destinations together at last in one phenomenal package. The exquisite capitals of Lisbon and Madrid; the colourful mosques and bazaars of Casablanca and Marrakech; the grand cathedrals and plazas of Seville… this trip has it all! Experience the cultural highlights of Spain, Portugal and Morocco on this 20 day package visiting Madrid, Seville, Badajoz, Marrakech, Rabat and beyond. 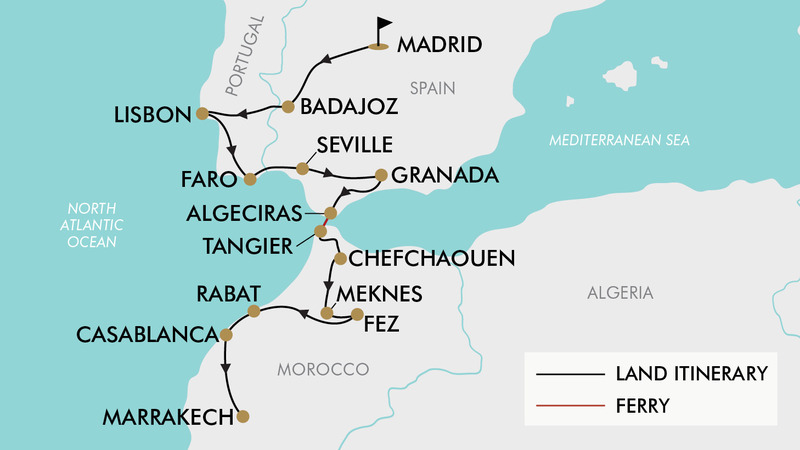 Enjoy guided tours through the grand capitals of Lisbon and Madrid, wander through the charismatic city of Seville, witness the stunning beauty of Alhambra Palace rising above Granada, and then travel by ferry to Tangier in Morocco. From here, experience the blue-washed town of Chefchaouen, the Roman ruins of Volubilis, the Hassan II Mosque in Casablanca, and so much more! Includes return international flights, 17 nights hotel accommodation, 18 meals, English-speaking tour leader and guides, and more. Today depart from Sydney, Melbourne, Brisbane, or Perth for Madrid, Spain. Fly with either Emirates, British Airways, Lufthansa or Austrian Airlines to name a few (subject to availability). Welcome to Madrid! Be met on arrival and transferred to the hotel for the night. Enjoy breakfast at the hotel before departing on a half day guided city tour. Take in sights such as Gran Vía, known as the ‘Spanish Broadway’ and the street that never sleeps; Plaza Espana; Puerta del Sol, the centre of the radial network of Spanish roads; Paseo de Castellana; Puerta Toledo and Puerta de Alcala. You will also see the Royal Palace (entrance not included); official residence of the Spanish Royal Family and the historic Cathedral de Almudena (entrance not included). Continue your Spanish journey as you travel to Badajoz, which is situated on the left bank of the river Guadiana, close to the Portuguese border. It has always been marked by its proximity to the border. Enjoy the remainder of the day at leisure. Perhaps take a stroll around the historic quarter, which will reveal Arab walls, interesting monuments, and picturesque streets and porches. After breakfast depart for Lisbon, the capital of Portugal. Enjoy the rest of day at leisure in this beautiful city, which embraces modern culture whilst maintaining its unique heritage and traditions. Today enjoy a half-day guided tour of Lisbon. Wander through the maze-like streets to reach the main attractions. See Lisbon’s Cathedral and Casa dos Bicos, the old city’s pastel-coloured buildings, Tagus Estuary and Ponte 25 de Abril suspension bridge. Afterwards enjoy the remainder of the day at leisure. Today continue to Faro the capital of southern Portugal’s Algarve region. The city’s neoclassical Arco da Vila is on the site of a gate that was part of the original Moorish wall. The monumental archway leads to the old town, with its cobbled streets. Nearby is Faro Cathedral, built in the 13th century. The Municipal Museum, in a 16th-century convent, displays prehistoric and medieval artifacts, plus religious art. Faro is a fascinating city, which combines an extensive history, interesting tourist attractions and an abundance of Portuguese charm. Today travel to Seville, the capital of southern Spain’s Andalusia region. It’s famous for flamenco dancing particularly in its Triana neighbourhood. Enjoy an afternoon at leisure in this charismatic city. Join your tour leader for a morning walking tour of the city. See the gothic Cathedral and the Giralda Tower, a former minaret converted to a bell tower (entrances not included). See the tiled fountains, pavilions and lush palms in the Maria Luisa Park - renowned for its landscape design - and walk through the imposing Plaza de España. Also walk through the former Jewish quarter. The rest of the day is free at leisure. Tonight you might like to experience a fiery flamenco show (not included). Today enjoy the day at leisure to explore on your own, or take the opportunity to take part in a day trip to the must see UNESCO World Heritage Alhambra Palace (not included). Guests who are interested in doing a day trip are advised to book these tickets online well in advance in order to secure their place. Please note: this tour cannot be booked whilst on tour with the operator. After breakfast and check out you will be transferred to the cruise port of Algeciras, where you will board the ferry to Tangier, Morocco (approx. 1hour). Tangier is a Moroccan port city on the Strait of Gibraltar, which has been a strategic gateway between Africa and Europe since Phoenician times. Upon arrival you will enjoy a guided tour of the Medina. Drive today to Chefchaouen, a hidden gem and one of the most beautiful cities on the planet. Tour Chefchaouen, the blue-washed old town (medina) by foot along with your guide, who will share stories of Chefchaouen's history. Start your tour with the Kasbah Museum in the medina. The Kasbah of Chefchaouen belongs to the early 18th century, and was built by the legendary ruler Moulay Ismail. It is fairly simple in design without architectural surprises, however it is surrounded by gardens on the interior and exterior. Inside the Kasbah you can visit the ethnographic museum, which contains antique weapons, musical instruments and photographs of the old town. This morning depart for Rabat. Upon arrival enjoy a guided tour of the main monuments of the medina. Visit the Royal Palace (Mechouar), the Kasbah des Oudayas, the Mausoleum of Mohammed V, and Hassan Tower (all entrances included). Following breakfast, travel to Marrakech. Enjoy the rest of the day at leisure to perhaps discover the Medina or visit the vibrant Jemaa El Fna, the famous square and market place. This morning after breakfast enjoy a guided tour to discover the spectacular sights of Marrakech. The city guide will take you to see the Bahia Palace, the 16th century Saadian tombs, and the Dar Si Said Museum (entrance not included). Next enjoy some free time to visit the largest mosque in Marrakech, Koutoubia, or perhaps venture through the old streets of the medina to the Koranic School and the Museum of Marrakech. The evening is also free at leisure. For solo travellers a mandatory single supplement of $1650 applies. Please note: dates/months with a * incur a land high season surcharge of $300 per person. - Business Class: Buy now for $6999 per person. - Madrid, Spain (Pre Tour): $320 per room. - Casablanca, Morocco (Post Tour): $230 per room. Minimum group size 25, maximum group size 35 per vehicle. - Portugal is classified as a warm temperate forest climate, with wet winters, dry summers and the warmest month above 22°C on average. The best time to visit Portugal is spring when dazzling flowers carpet hillsides and the almond blossom lights up the countryside – or early autumn, when the weather is warm but not too hot and the summer crowds have thinned out. - In Spain, August is the hottest month with an average temperature of 24°C with the most daily sunshine hours. Spain enjoys a warm Spring and Autumn. - Morocco's climate is moderate and subtropical, cooled by breezes off the Atlantic and Mediterranean. In the interior the temperatures are more extreme, winters can be fairly cold and the summers very hot. The country is at its most beautiful in spring when the landscape is green and lush, making for spectacular mountain hiking. Morocco is also lovely in Autumn when temperatures are very pleasant. Gratuities (tips) are not included in the tour price for services of the tour leader (when available) and driver throughout the tour. The recommended tip for the tour leader and driver is €5 per person per day, which will be collected whilst on tour.